Sol and Luka got the Nick Anderson Photographic treatment recently and I am working on the proofs that I will soon present to Laura and Bern. The studio work went brilliantly and I was delighted with the results. All four of my subjects worked hard and were great models, albeit with quite different qualities. Bern is a real character and although he looks a bit daunting he is a lovely guy and a quality musician. Laura has a real sparkle and beautiful looks with skin tones to die for! 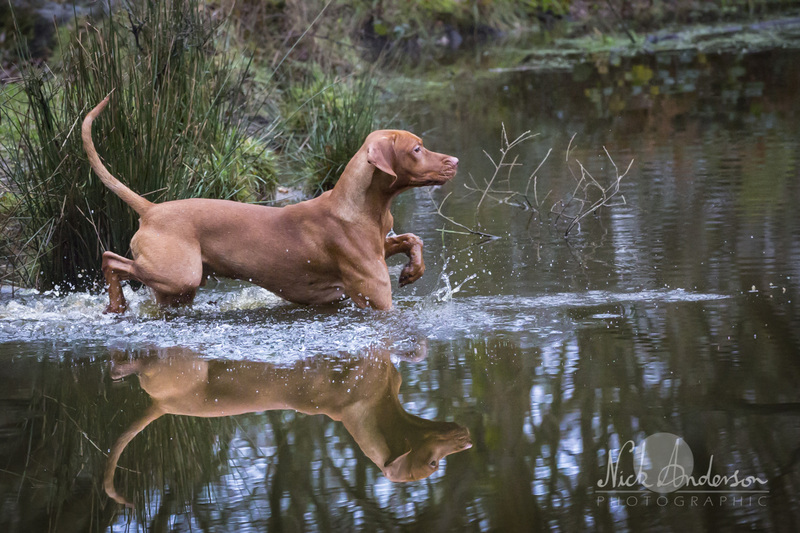 However, I was there to photograph their Vizslas who were also quite different. Luka is a little monkey and always full of fun whilst Sol takes his time to get to know you and even by the end of the day stayed a little aloof. Shooting outdoors at this time of the day is often difficult with short daylight hours, a low sun and plenty of dreary cloud! Our day wasn’t good with heavy overcast and low light levels. It becomes a balancing act between getting the best settings for the shoot whilst trying to avoid the noise that accompanies high ISO settings. Inevitably, towards the end of the shoot the light started to fade fast and I am now working hard trying to get the best out the last hour’s shoot. The shot above was towards the end of the outdoor session and although I didn’t manage to get any big splashes the calm water gave me some great reflections. I wish we had had a bit of sunshine to light things up a bit but to be fair, the results we got were great. Can’t wait to hear what Laura and Bern think! I have been working behind the scenes revamping my business. I am well on the way to getting a professional web site organised that will allow my clients much more freedom to select and use the photos I take. The aim is to charge a basic price for a shoot and then allow customers to purchase as many photos as they want from the portfolio. This means they won’t be paying for more photos than they want or for expensive full licenced photos when they only want a single print. This is a great business model for both the photographer and the client. It will also allow whizz photos to be easily ordered directly from the website without me having to quote per image. If it works as I imagine there will be a choice of either downloading the image file or ordering prints and other products directly. There is still a lot of work to be done developing the site as well as checking print quality and workmanship of the various products on offer but I think it has the potential to take Nick Anderson Photographic to the next level. Inches from a nasty end! Landscape photography isn’t one of my favourite genres but I often use an interesting landscape in my photography so a good knowledge of the techniques is important. When I have a hound in the picture I often throw the landscape into a soft focus so that the subject is clearly defined. More traditional landscapes are clearly sharp from foreground to infinity so to achieve this a small aperture (large f stop) is required, so today I used Av (Aperture priority) with f 16 set. The camera changes the speed to set the exposure so I needed to have the ISO high enough to keep it around 1/200th or so. A small aperture combined with a descent wide angle lens gives an impressively large depth of field which goes from a couple of feet to infinity. The other element of great landscapes is good light and the best is found within the golden hours of dawn and dusk. This image isn’t taken with that beautiful light to help it but it is a dramatic view and is early enough to have some nice low shadows to encourage it. The main problem with getting this angle was the need to stand on the edge of a rock over a 1000ft fall… not the most sensible action for someone with two dodgy knees and an arthritic hip! What it really needs is a ginger Vizsla sitting on the rock. Back on the day job and wending my way to Cape Town for a couple of nights. A long flight this so over the next few days I will be spending about 27 hours in the aluminium tube being gently desicated. I have my camera gear so will be doing some stock photography work while I am down there. Probably some of the usual stuff… Table Mountain and the local views etc. With the events marking the death of Nelson Mandela there may be something more interesting going on so I will be keeping my eyes open. I’m sure there must be a fish market somewhere or some local markets that might add some colour but we have been advised to be a bit wary as the once safe city is becoming a little less so for visitors. I think I have my Eye-Fi card with me so I will shoot with the camera recording RAW on the CF card and med (internet) quality JPG on the Eye-Fi so that I can transfer those shots to my iPad and post them. I’m trying to do without a laptop down-route to save weight but its not particularly easy to get images out of my camera and onto an iPad. The Eye-Fi card should get around that problem as it has a mini WiFi built in which can create an adhoc network that my iPad can join. Once created, I can transfer my photos. One thing the iPad definitely can’t do is work with RAW files… hence the need to record a duplicate of each shot in JPG that is more easily handled. So whats the difference between RAW and JPG files? Well the RAW file is the data straight off the camera’s sensor and saved in a file before the camera software does any alterations. Because it contains a lot of data the files are big… around 20mb or so. To become a viewable image the RAW file must be put into a conversion programme and then the photographer can choose how to adjust the image to suit… in my case I use Adobe Lightroom 5. When the camera records in JPG the RAW image is automatically adjusted and converted to the JPG format by the software in the camera itself. It does the job by applying a set of general algorithms which usually do a good job but can easily be fooled. Once the conversion is done, most of the sensor data is lost as the JPG file is compressed down to around 7mb so any tweaks you might want to make are more limited. The main problem with RAW conversions is a matter of time. To individually adjust every image from a shoot of several hundred is quite a task but the benifits in the quality of the finish product are enormous. From the moment I saw the gleam of sun through the gaps around the curtains this morning I thought that it would be a lovely day for a few photos. As soon as I had a bit of coffee down my throat I buckled on my 70-200mm lens and headed out with the dogs. Although it was quite a while after dawn the sun was still low with that gorgeous golden quality that so suits this time of year. The fallen leaves and dead bracken make such a great backdrop for my Vizslas and combined with the warm quality to the light, it almost looks surreal. Shooting down sun gives that rich colour we expect but I tried a few into the low light which has the benefit of rim lighting the dogs hair but takes some of the richness of the colour away. They both have their qualities but I particularly like this shot. It was hard to achieve as I had to focus through the reeds so that Blue’s eyes were in focus but I like the idea of her half hidden and peeping through the cover. Haven’t picked up my camera in the past few days so I thought I would post something from my library. I took this during a lion walk I did on the island of Mauritius a while back. With lions around no wonder all the a Dodos disappeared! Plenty of work coming up… hoping that the weather breaks and we get some decent light. High speed outdoor shooting isn’t easy at this time of the year when conditions are often heavily overcast! At last I am in a position to get a new work computer and once I learn Mac speak I will hopefully be able to speed up my post processing. My current machine takes about 5 hours to download a 20 gig shoot via USB 2 but, I am reliably told, that a Thunderbolt port will do it before I even get to plug it in!